It is widely accepted that farmed animals consume more food than they produce. The question is not “IF” animals are inefficient food converters, but “HOW” inefficient are they? And are those inefficiencies worth having meat? While these issues are generally discussed in terms of “efficiency” not “inefficiency,” based on the inherent loss of crops and natural resources involved in producing animal sourced foods (ASF), “inefficiency” is a far more accurate term. 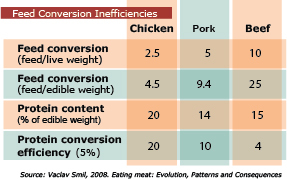 Inefficiency is determined in large part by Feed Conversion Ratios (FCRs), which measure the amount of feed crops needed to produce a unit of meat/ASF. This page will explain some of the factors that produce such wide variation and make recommendations based on the most useful measures. The numbers below represent FCRs for crop-fed farmed animals. In other words, how much more food animals consume than they produce. Typical feed crops are grains and legumes: corn, soy, and wheat. These numbers are important as crop-fed, factory/conventionally-farmed animals are the norm, representing the overwhelming majority (>98%) of meat produced in the United States. Furthermore, the global growth-rate of meat is alarmingly high. (There are different, but still serious concerns about grass-fed cattle). Live weight FCRs – will have lower ratios because they represent the number of pounds in crop that animals consume to gain one pound while they are alive. Edible weight FCRs – will have higher ratios because they more accurately represent the amount ready-to-eat of meat produced after slaughter and processing. Most of the caloric energy animals consume is used to fuel their metabolism and to form bones, cartilage, feathers, fluids, and other non-edible parts. Thus, the inefficiencies more than double when liquid weight is removed – the weight of the water, blood, and other bodily fluids. Further weight loss occurs with the removal of bones and other non-consumable body parts. Often times, the food industry will publish the low end FCRs, which minimizes the perceived waste. Those without a vested interest in animal agriculture and/or industry critics are more likely to publish the higher (more accurate) post-processing carcass or boneless numbers. Even if method is held constant, there will be a variation in FCRs. Other factors that affect FCRs include: type/quality/moisture of feed, animal age, breed, activity level, number of offspring, and a host of other variables. There is a great deal of focus on improving these factors in reduce inefficiencies, but the inherent waste of cycling crops through animals remains. Adjusting these factors merely shaves down some of the numbers without addressing the core issue that feeding animals to produce food is a massive net loss of available global calories and protein. New, more comprehensive methods show that even the high-end of commonly cited FCRs are highly conservative. Perhaps the most accurate way to gauge the inefficiencies of animal sourced food production is to calculate the sector-wide phytomass (plant biomass) energy that goes into animal production versus how much energy comes out in the form of animal sourced foods. In other words, what portion of plant energy dedicated to raising animals becomes edible calories in the form of meat, dairy, and eggs. This method looks beyond costs associated with a single animal and instead at the the energy flows in the broader food system. By calculating the fates and flows of phytomass energy on a macro scale, it is possible to track how and where food energy is being wasted in the production of various food products. Wirsenius’s work takes a macro look at the food system, calculating how much phytomass is appropriated for food production in the form of pasture and cropland, related to how much food is produced. This method is helpful because it gets at the total food energy that into animal agriculture as a system. According to previous estimates, over two-thirds of phytomass energy appropriation is dedicated to farmed animal production, despite that the sector only produces about 13% of total food calories. In the same way that one can get an accurate estimate of how much a college education will cost by including the cost of housing, supplies, and other living expenses with the cost of tuition, so too can one get a more accurate estimate of the inefficiency with which farmed animals convert plants to animal sourced foods by considering the feed needs (including pasture and grain) of the animal agriculture sub-sectors. Another strength in Wirsenius’s method is that, unlike the previous feed conversion methods that only calculate conversions in terms of feed such as soy or corn, it also factors grass and forage into its calculations. Grain weight is easier to quantify since producers tend to purchase and feed it to animals in given weights, whereas the amount of grass and forage animals consume on pasture can only be roughly estimated. In this gross energy calculation that looks at all phytomass appropriation involved in food production, pasture land is the largest source of phytomass energy. This, combined with the inherent feed conversion inefficiencies of cattle, are one of the reasons why beef production is one of the least efficient forms of food production. But even if we were to adjust these calculations to remove the phytomass energy derived from non-edible material, such as grass on open pasture or the straw that is used as bedding in some animal operations, there would still be a dramatic difference in the quantity of food that can be yielded as edible calories for human consumption from livestock food and from plant-based protein alternatives. Regardless of the exact numbers, producing crops (soy, corn, wheat, etc.) 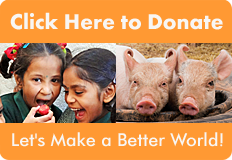 for animal feed is many times more resource-intensive than using crops for direct human consumption. While there are perilous trade-offs related to fuel vs. food, a more serious concern for a variety of reasons is feed vs. food. Smil, Vaclav, Feeding the World: A Challenge for the 21st Century, MIT Press, 2000, p. 145-157.